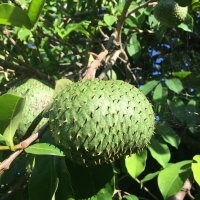 The Soursop is native to the nothern parts of South America. In its tropical conditions it grows vigorously and seedling trees will fruit within 2-3 years. In the subtropics it requires substantial protection from cold winds and will not tolerate frosts. The tree prefers deep well drained semi-dry soil. 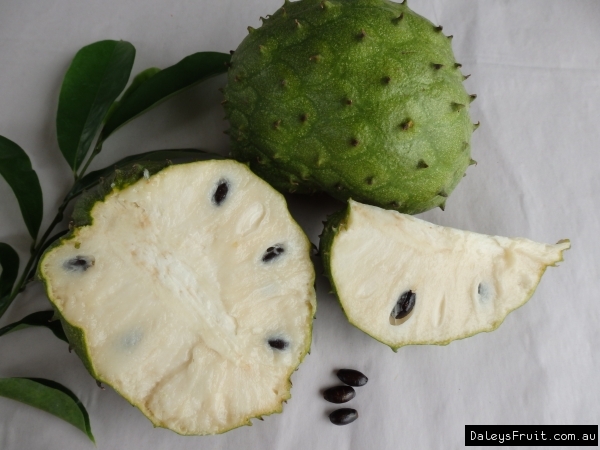 The fruit is heart-shaped with a rough green skin and soft fleshy spines. The fresh meaty flesh is juicy and slightly acid producing a rich creamy thirst quenching juice. Superb when fruit is pureed with 1/3 of vanilla icecream. The fruit can also be dried into a sweet fruit leather. Grafted varieties have the least acid flavour and least fibrous consistency. 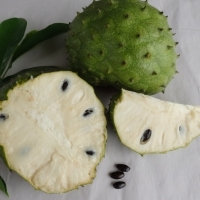 Immature soursops are cooked as vegetables, used in soup or roasted. 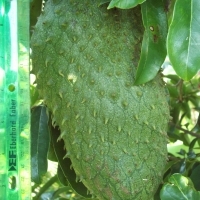 South American selection producing enormous, conical fruits which typically weigh upwards of 7KG. Specimens exceeding 10kg are not uncommon in older, established trees. Flesh is firm and white, with less fibre than other commercially available varieties. A seedling selection of this highly sought after fruit, this selection has been grown from a variety with smooth flesh.